Description: On this episode, Laura Chandler speaks with Tibetan Buddhist teacher and founder of Nangten Menlang Buddhist Medical Center, Tulku Lobsang Rinpoche. Tulku Lobsang Rinpoche was born to a farming family in Tibet in 1976. He entered the Sowa Monastery at age six, and at age eleven, he went to the Nangzi Bön Monastery, where he studied Dzogchen. Tulku Lobsang was identified by the oracle of Tibet as the incarnation of the master teacher, Tulku Nyentse, and at age thirteen he was enthroned as the eighth incarnation of this master teacher. Tulku Lobsang has received teachings in all of the Tibetan Buddhist traditions, and teaches and lectures throughout the world on the subjects of Tibetan Medicine, Buddhism, and Astrology. In part one of this two-part episode, Tulku Lobsang discusses his childhood, his imprisonment by the Chinese, and his daring escape from Tibet. He explains what it means to be a Tulku, or reincarnated master, and how he was enthroned at the age of thirteen. Also discussed are the benefits of Tibetan medicine and a form of Tibetan exercise known as Lu Jong, which helps to release blockages in the body. To learn more about Tulku Lobsang you can visit his website, tulkulobsang.org. 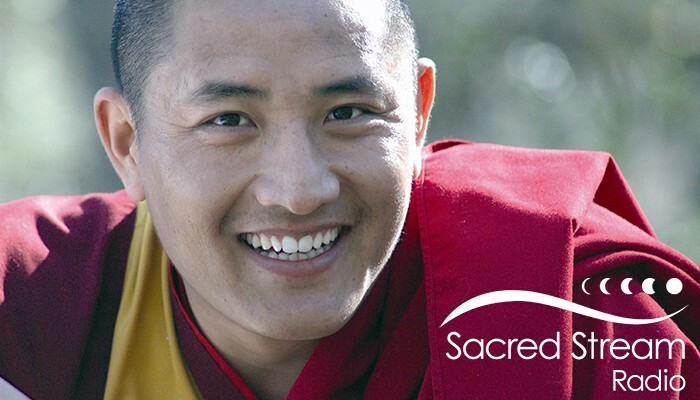 This episode of the Sacred Stream Radio Podcast features music from the Monks of Gaden Shartse Dokhang and their Mantras for Meditation album, released on Red Cow Records. Tulku Lobsang is part of the Wisdom in Exile Conference, a free conference where renowned Tibetan Buddhist practitioners come together with esteemed scholars to explore the profound insights and perennial teachings of one of the world’s great wisdom traditions. Other guest teachers include, Robert Thurman, Isa Gucciardi, Thupten Jinpa, Tenzin Wangyal Rinpoche, and Lama Tsultrim Allione. For more information or to join, visit embodiedphilosophy.org.